The weather improved enough that we spent all morning walking The Philosopher’s Path on Kyoto’s eastern edge. 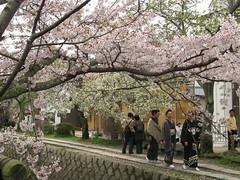 A lovely cannel, just a few meters wide and yet more cherry blossoms. The breeze was knocking the petals loose and covered the ground with pink snow. 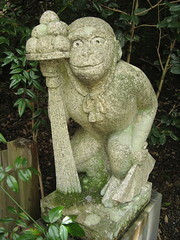 Along the route are several temples and the most interesting one was Okoto which has little statues of rats and monkeys. 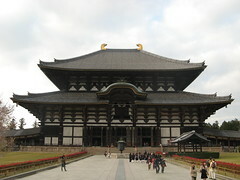 With that we felt we’d seen enough of Kyoto for this trip and hopped a train to Nara with just enough time to reach the largest wooden temple (structure of any type?) in the world. 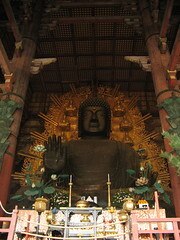 Inside is an enormous bronze Buddha, originally cast in 746! I really had little understanding of how massive it was until we stepped into the darkness and looked waaaaaay up there. 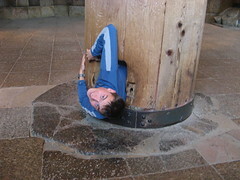 Lorraine and I each took the chance to climb through one of the pillars like my parents did 27 years ago. Maybe nearly three decades of tourists have widened it but I certainly had no trouble getting through unaided. Despite all the views and history the highlight of the day came in a small okonomiyaki restaurant called Kotaro on a quiet street of Nara. There I met the owner Jun Ohashi and his wife Kyoko. We had poked our heads into one little restaurant before but they said they didn’t do tempura so we moved on. As we stood outside this one Jun peered over the frosted glass and beckoned us in. As the only customers we got their full attention and I tried out some of my stumbling Japanese conversation. They were so nice and friendly, writing down new words for me and repeating them slowly until I improved my pronunciation. I mentioned my trip and he verified that I actually meant that Cape Sata and that Cape Soya, then kept repeating “good times” in Japanese :). As well as our okonomiyaaki we were given a delicious dip made of soy sauce and citrus juice and an omelette of tororo (a Japanese version of taro from the look of the plant). We left in high spirits re-assured of the legendary Japanese hospitality and with me promising to return some day to tell them about my trip. Your description of pink snow falling is an instant reminder of what it is like during Cherry Blossom time there. 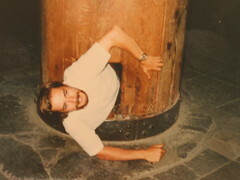 Glad you ventured into the Kotaru. It is often the people you meet along the way that provide the best memories of the trip. Thank you very much for visiting to our restaurant last Tuesday. It’s our pleasure that you like “okonomi-yaki” . Soon you start to walk across Japan. Have a good time and enjoy your trip! I will read your “blog” everyday. See you again and good luck! Is that your Dad? At first I thought it was you! I never really noticed how strong the resemblence is. You even have his crazy beard growing style!